German Talmudist, liturgical poet, and chronographer; born in 1133; died after 1196. 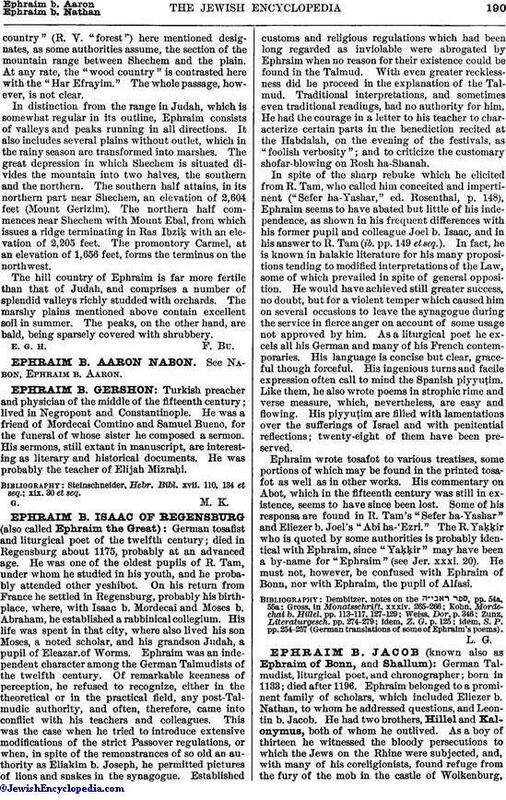 Ephraim belonged to a prominent family of scholars, which included Eliezer b. Nathan, to whom he addressed questions, and Leontin b. Jacob. He had two brothers, Hillel and Kalonymus, both of whom he outlived. As a boy of thirteen he witnessed the bloody persecutions to which the Jews on the Rhine were subjected, and, with many of his coreligionists, found refuge from the fury of the mob in the castle of Wolkenburg,near Königswinter, in the archbishopric of Cologne. Later he lived at Neuss, and left there for Cologne only a few days before the massacre of 1187. He lost, however, on this occasion, a large part of his fortune. He seems to have resided usually at Worms. Ephraim was one of the important German Talmudists of his time, although comparatively little is known of his work in the field of Halakah. He frequently wrote responsa in conjunction with Judah b. Kalonymus, Moses b. Mordecai, and Baruch b. Samuel; several of them are quoted in the "Mordekai"; but the "Ḥibbur" mentioned in the "Mor-dekai" is not by him, but by Ephraim B. Nathan. Ephraim is better known as a liturgical poet. Zunz enumerates twenty-three of his piyyuṭim, several of which are found in German and Polish liturgies. For instance, his "Elohim Ẓiwwita Lidideka" and "Ha-Raḥman Hu Asher Ḥanan" are still recited in Germany on the occasion of a circumcision. 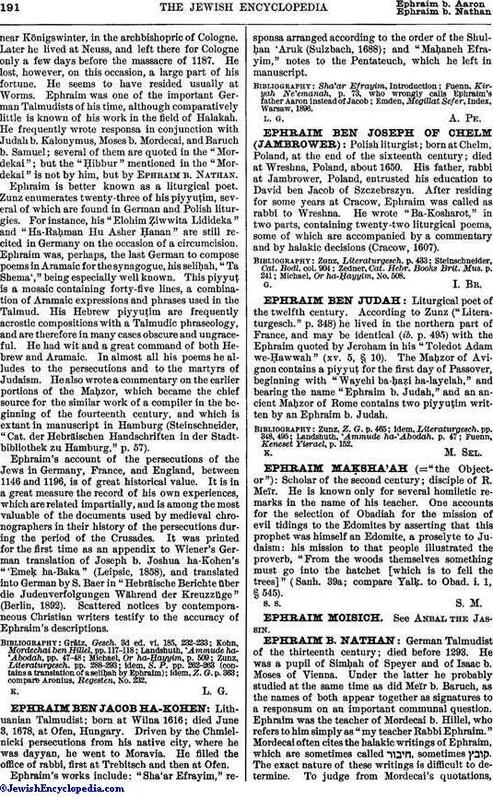 Ephraim was, perhaps, the last German to compose poems in Aramaic for the synagogue, his seliḥah, "Ta Shema'," being especially well known. This piyyuṭ. is a mosaic containing forty-five lines, a combination of Aramaic expressions and phrases used in the Talmud. His Hebrew piyyuṭim are frequently acrostic compositions with a Talmudic phraseology, and are therefore in many cases obscure and ungraceful. He had wit and a great command of both Hebrew and Aramaic. In almost all his poems he alludes to the persecutions and to the martyrs of Judaism. He also wrote a commentary on the earlier portions of the Maḥzor, which became the chief source for the similar work of a compiler in the beginning of the fourteenth century, and which is extant in manuscript in Hamburg (Steinschneider, "Cat. der Hebräischen Handschriften in der Stadtbibliothek zu Hamburg," p. 57). Ephraim's account of the persecutions of the Jews in Germany, France, and England, between 1146 and 1196, is of great historical value. It is in a great measure the record of his own experiences, which are related impartially, and is among the most valuable of the documents used by medieval chronographers in their history of the persecutions during the period of the Crusades. It was printed for the first time as an appendix to Wiener's German translation of Joseph b. Joshua ha-Kohen's "Emeḳ ha-Baka" (Leipsic, 1858), and translated into German by S. Baer in "Hebräische Berichte über die Judenverfolgungen Während der Kreuzzüge," (Berlin, 1892). Scattered notices by contemporaneous Christian writers testify to the accuracy of Ephraim's descriptions. compare Aronius, Regesten, No. 232.